As part of my PhD wanderings, I’ve recently become interested in the affective turn, in part due to some of the really stimulating discussions and readings which I’ve been lucky enough to take part in through the Human Geography department. One of my supervisors has written quite extensively on affect also, and suggested quite a few readings that we discussed in a recent seminar, where we’re trying to think about writing about place. A particularly interesting reading came from Kathleen Stewart, about revisiting her home region on the North Eastern seaboard, which I greatly enjoyed as much as anything because of the quality of the writing, which for me, falls in between crafted description, informed academic observation and personal narrative (of grief, perhaps). Read it on the train going over to Swansea, and it was very moving, which isn’t something which we can say often about academic writing. I’m still trying to absorb some of this as someone new to Affect Theory, but further on in the introduction to this book, I also came across the list of influences that had inspired her, including Roland Barthes, and in particular his idea of punctum (which he explored in Camera Lucida, his book about photography), and which she defines as “the wounding, personally touching detail that establishes a direct contact” (p.6). As someone who’s been a social and health researcher over the last ten years or so, this idea struck me as interesting on two counts: there are undoubtedly moments in any qualitative research project that involves talking to others in which a connection on an emotional level with those who participate with us, or with a small detail of the scene before us, can lead to a perceived leap in our analytical understanding of what we’re trying to explore, and secondly, that this leap or what I’ll call punctum (often beyond language) may offer a glimpse of these animate circuit(s), referred to by Stewart and others. I speculate here that punctum could be a phrase or turn of phrase, a gesture, a moment of sadness or laughter, that moment when you take in the entirety of a place through your senses or when something connects strongly to your own history or experience. It usually leaves a strong imprint on the mind’s eye somehow, and can potentially lead to what feels like a more profound understanding of the particular field we’re in (…though I’d readily acknowledge that this might not always be the case, and as researchers there’s always the need to guard against being insufficiently reflexive as we shape our understandings of the world). Going through some recent field notes, I came across an example of this where a chance conversation at the end of a day’s observations at yet another dementia networking event (in yet another arts centre, I’d noted), left me thinking about the role of grief and guilt for those caring for those affected by dementia. I’d spotted S. hovering about what had been a very interesting day of connecting and talking to some of those who I’ve already got to know, and meeting another fantastic DEEP group , and just as things were being cleared away, we caught each other’s eye and started to chat. S. described herself as a ‘post-carer’ which I thought was an interesting turn of phrase, but this led us onto a discussion about grief and the role of carers, and how to cope with her own grief, she’d begun to write. It was at that point, though I’d heard others talk of how they coped and I’m witnessing all kinds of creative endeavours around this field of developing dementia friendly communities, that I suddenly felt connected on quite an emotional level to how we cope with being witnesses to the decline and deaths of those close to us. In part, this was because it brought up my own experience of trying to cope with the loss of my brother, and how the private act of writing, among other strategies, had helped greatly during his illness and after he’d gone. It was a shared moment of recognition with S., which I think she also sensed, and became a point of clarity between us; without a word said, we both knew exactly where we stood, or at least that’s how it felt for me. With a clear voice, she said: “The voice of carers isn’t heard as much as you’d think. They are going through a continual process of bereavement from diagnosis onwards”. That moment also brought back, powerfully, other stories in other research projects in which I’d sat and talked to carers of those with dementia. But somehow, it also seemed to catch something which had been at the back of my mind all day; though nominally successful on one level, the event wasn’t that well attended and there was something strained in the air (there are particularities about the day which I noted in my field notes, but which aren’t for discussion here). There was a sense of things going unsaid, something hushed, even though seeing some schoolchildren run around as part of an inter-generational project or meeting the DEEP group were genuinely joyful encounters. Post the recent Welsh Government consultation on dementia friendly Wales, and around the time it was becoming obvious how inadequate the initial draft of this strategy seemed, and how successful dementia activists had been in making their points about this, S.’s comments seemed to hit home something about grief, an undertow of exhaustion. After all, this was in a town in which the idea of ‘Dementia Friendliness’ has been in the air for a good few years by that point. What I’m choosing to describe here as a punctum, or ‘a wounding, personally touching detail that establishes direct contact’, remained with me for a while afterwards. Aside from the empathetic quality to such moments, which I think we should never ignore when we are involved with other humans in trying to understand the stories and feelings which are part of our research, there was an important analytic aspect to this in a field (dementia studies and the biopolitics which surrounds it) in which the word ‘voice’ is often used and given meaning by all kinds of actors, in as part of various discourses; it will hopefully sensitise my ongoing analysis of this field to other ‘animate circuits’ around caring for those affected by dementia and how they cope when often the focus is mainly on the person with the condition, not those who do the caring. It also reminds me to look up and around to the atmosphere in which such a punctum is created and ponder how it got there. A few days ago, went along to the second round of consultation for the new ‘Together For a Dementia Friendly Wales’ strategy, where I find myself in yet another arts centre ‘networking’ about dementia. But it turned out to be a thoroughly interesting meeting for several different reasons relevant to my research at the moment. This second part was to build on the first round, and was jointly run by DEEP and The Alzheimers’ Society, which in itself is significant to me because I think both organisations come from quite different perspectives, something which later on during the day struck me as having some symbolic resonance (for want of a better expression) in that particular venue. Having already helped to craft the departmental response to this document, it has to be said that it singularly uninspiring in its tired public health approach, and without being unduly critical, there was a consensus among colleagues about not only how poorly written it seemed, but there were enormous holes in terms of looking at residential care, or more fundamentally, what the kind of philosophical or societal leaps are needed to underpin such a ‘vision’ – beyond the rather tired framing of health ‘risk’ for the population. 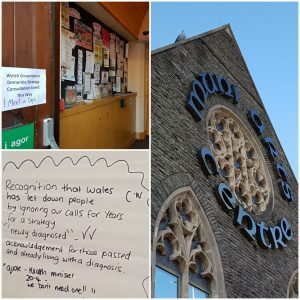 Everyone welcomes the person centred approach, but by now, fundamentally moving towards a more rights-based position for people affected by dementia, one where their voices are heard and respected, should be the new norm, and in fact (form several readings, not just my own) is surely the basis of the Social Care and Wellbeing Act. Yet there was scant mention of this. But this detail is not for here. A couple of weeks later, reviewing my notes I saw that this was possibly one of the most significant public meetings I’ve been to so far in terms of my PhD, and not only because of the overall framing of such events (‘consultations’) that are by now such an established technology of government, arguably also a key component for manufacturing consent or even conducting conduct. All these more theoretical considerations are important, but of equal significance as I look back on my notes are some of the other more symbolic, contextual and even historic resonances which came up. There are three main points, not entirely unrelated. Firstly, the presence of many people who are actually affected by dementia personally or as carers, or as people who had lost someone close having care for them, made a massive difference on the day. If there was one things sorely lacking in the consultation document, it seemed to be that they hadn’t really been taking notice of how other nations, similarly placed, have done this kind of thing. Scotland, after all, is on it’s third such strategy. That said of course, here we were in the consultation, but my impressions form the day were of the overwhelming indignation felt by many in the room, because of a lack of strategy; some had lost loved ones and one of the principal demands made was for the Welsh Government to apologise for this perceived indifference that people had felt over the years. Basically, when parts of the strategy were actually discussed, it was taken apart. In addition, from my jottings, I noted that there were some fundamental contradictions in terms of the subjectivities expected by ‘government’, clearly on display here: there were the true stories of people who were affected by the condition and who had been encouraged to come along to such events (partake in ‘active citizenship ‘ – the very thing the system is now demanding of us all), but who were also facing a cut to their PIP (…from another part of government). A field-day for Foucauldians everywhere, here we have government simultaneously trying to shape the conduct of the citizenry in a late-liberal way, while also casting its punitive gaze; truly a twisted take on responsibilization, ( ‘we want you to be active, but now you’re too active, and we’re going to take your money away….’). But beyond this consideration, this is surely one of the glaring injustices which will have to be addressed; we know that Welsh Government is (seemingly) powerless when faced by the rotten logic or heartlessness of the swivel-eyed ideologues still making hay out of the financial crisis, determined to cut the state. The very heart of the DFC agenda, I’m afraid, is utterly intertwined with austerity logic. Of interest here though is the fact that these dementia activists – that’s what they are – are beginning to make common cause, loudly, with others who are being slashed and burnt, in the name of citizen sacrifice. ….in the second half of the nineteenth century….English medical control …provoked violent popular reactions and resistances, small scale anti-medical insurrections…I think it would be interesting to analyse how this medicine, organised in a form of control of a needy population, incurred such reactions…..For example, it is curious to observe that the dissident religious groups, so numerous in the English-speaking Protestant countries, has the primary goal in the seventeenth and eighteenth centuries of opposing state religion and interference by the state in religious affairs, whereas those groups which reappeared in the course of the nineteenth century were concerned with combating medicalization, with asserting the right to life, the right to get sick, to care for oneself and to die in the manner one wished. This desire to escape form the compulsory medicalization was one of the characteristics of one of these numerous apparently religious groups that were intensely active at the end of the nineteenth century, as they still are today. In some other writings, Foucault also singles out the Wesleyans as one of these groups. So here we were, in 2017, in a building with roots in a Christian grouping which may have been active in anti-medicalization battles, ostensibly taking apart a document which had, for the most part, too much ‘health’ and ‘risk’ in it, and not enough about rights. One of the activists there actually said to me at the end of the day, as we were introduced: ‘you mark my words, it’s time for dementia to come out of psychiatry and into society….they won’t know what’s hit them over the next few years‘. Extending he metaphor further, I’d place the vocal and effective members of the DEEP group present (DEEP having Quaker roots – derived from JRF….) and the more centralized, corporate feel to the Alzheimer’s Society, for example, in no way a judgment on the effective way that both organisations ran the day’s proceedings. But there are fundamental differences in approach between the two I think. The final point relates to the unsaid and perhaps unrecorded rituals of the day, if not the rituals of the myriad types of citizenship which seem to be part of this field. Going back to the mechanics of consultations as technologies of government, I noted also, given the setting, the rituals of presenting the text (not the Bible, but the strategy), the confessional (as we heard the stories and accounts of people’s lives), and also the laughing and crying of the consultees (congregation). At the end of the day, I think we all felt a sense of catharsis, but it’s surprising to me how close to the kinds of rituals that would have been enacted here, to an extent, all those years ago, everything felt; there’s a vast literature on this from Weber onwards, including Foucault, on this – but as part of the fieldwork for the PhD, it was a powerful moment of recognition, which has given me a lot to think and write about beyond this blog post. Author awPosted on February 10, 2017 January 19, 2018 Categories fieldwork, PhDTags carers, citizenship, dementia, FoucaultLeave a comment on Consultation, government technologies….